When was the last time you honestly looked at yourself and wrote down what you are good at, what your strengths are and what you need to improve in your life? We all are a work in progress and continually are developing ourselves to be better. If not you might be stuck or don’t see your own worth. Let me say it you are worth this life you are living. We all make mistakes, trust me I’ve made my share, but you learn from every challenge and stressors you face. We go through seasons in our life, and it’s up to us to rise. I have decided to stick with love. 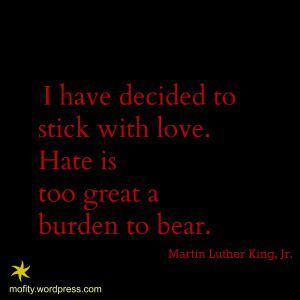 Hate is a too great burden to bear – Martin Luther King. Jr. Inner strength- I don’t sweat for pounds or inches or dress size. I sweat to make my outside match my inside. Somedays it’s not about health or building muscle, it’s just therapy!! If it’s a new year or new you changing something in your life, you can do this and start again. Life is too short, so do the things that make you happy… Be with those that make you happy. Surround yourself with the dreamers and the doers, the believers, the thinkers… But most of all, surround yourself with those who see greatness within you, even when you don’t see it yourself! Lord, guide my heart, hands, and words. As a caregiver sometimes it means to hold your tears and draw smiles on people’s faces. Keep calm; caregiving is not for wimps! Your greatness is not what you have it’s what you give. Pass your greatness to others every day. Live generously! If you stumble, make it a part of the dance! Don’t waste your energy trying to hide or cover up your missteps. Just laugh – and keep moving. And don’t let your fear of being imperfect stop you from doing the things that make you truly happy. Instead, decide to do them, imperfectly. You have to make peace with the changes and just love them how. They. Are now! You can miss someone who died. This is your Monday morning reminder that you are amazing and you can handle anything. Life can be tough, but so are you!! You are a treasure, a modern-day angel, a warrior when times are tough, a soothing balm when there is pain, a shining light when there is darkness. Although the days are busy and the workload is always growing, there are still those special moments when someone says or does something and you know you’ve made a difference in someone’s life. You will never regret being kind … anyone who takes time to be kind is beautiful. Kindness goes a long way… and yes, you are gorgeous. Positive thinking can change so many things in your life; you are entirely in charge of your life. Open your mind to great things and will come. What is the first thing that comes to your mind when you wake up? Is it negative? Ah, I don’t want to get up. Try this, before you get out of bed in the morning say ten things you are grateful for: your family, food on the table, a roof over your head, wellness the list can go on and on. Before you can transform your body, you have to modify your mind. Love yourself & your body – you are worth it! Caregivers are Magical T-shirt From A Fit Caregiver! 🔹Magical Caregivers this 🔹 is for you! Check out our caregivers are magical t-shirt. We’ve teamed up with Teespring to create the perfect t-shirt. Share & tag a hard-working caregiver. Note: Some of the links above may be affiliate links, which means that we may receive a commission if you decide to purchase through them. This is at no additional cost to you and merely helps us finance the free content supplied on our blog!